The gap between expenditures and taxes is widening. 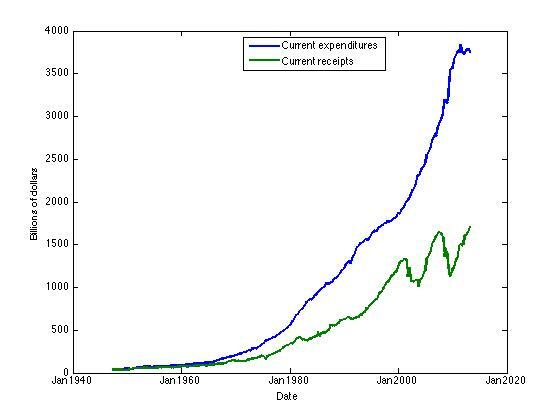 By the way, you can predict the expenditures quite accurately (about 98%) with a cubic equation. The awful truth about this is that nothing is going to happen because it really isn’t in any politicians interest to solve this problem. Solving problems means taking positions. Taking positions gives primary and general election rivals fodder for adds. Better to spout party line vagaries or distract with a personal attach than deal with real numbers. And the numbers really help no elected official either. Nobody, and this is my opinion, is serious about fiscal reform. Why do I say that? I do not believe for a minute that enough elected officials will support a deficit reduction strategy based on spending cuts alone to get enough votes to pass. The House recently pulled a spending bill from the floor due to lack of support and Hal Rogers, Chairman of the House Appropriations committee got riled about it (WSJ article here, Washington Post here and here). I have been saying this for years (annoying many in my department I am sure). It sounds good as an election slogan, but when it comes time to cast a vote that will put forth a policy we hear the crickets chirping. The last paragraph obviously looks like a slam on Republicans, which it is, and they deserve, but Democrats are no better. They fail to put forward a budget and they fail to get specific on how they will keep spending what they want to spend and pay for it. And I do not think it is easy to change policy. Ezra Klein summed it up well (article here). In short, the attitude of most people is, “Cut anything and everything, so long as it does not impact me.” This ends up pitting every state against each other with the equilibrium strategy being, “I’ll support your groups if you support mine.” The result is that far too little ever can be cut. So I say again, looking at the political constraints as they exist now, I do not think anyone is serious about cutting the deficit if they do not talk about raising taxes. I do not like it, I do not think it good for the economy, but if we are going to move to balance the budget, which I think we should, then tax increases will have to occur. This is one of the major reasons for gridlock in Washington in my opinion. Both sides know this to be true, but neither wants to get blamed for this so they just wait it out and hope for something to happen that fixes this. That’s right, as fiscal policy we are waiting for a magic lamp with a genie that can magically make the economy grow so that taxes can increase but everybody still gets richer. Of course those wishes always have a downside so I am sure it will mean that nobody would be able to afford anything anymore due to rapid inflation. But Dr. Flynn! The politicians *need* to have people fighting each other; keeping the masses at each other’s throats over over taxes, benefits, spending, etc., is how they keep themselves in their elected seats. That may sound cynical, but it is a very important truth when policy invades the lives of the citizen. Also, I think that there is an incorrect assumption that government will act in an efficient manner. Unlike a corporation, which is operating on a profit motive, government acts upon what I call the power-influence motive”. (The governments version of profit.) To increase it’s power and influence, it needs to be inefficient, because inefficiency leads to increase ability to wield power and influence upon the country through legislation. If government were efficient, it would cease to exist. That does not sound cynical to me at all. I think those two rules correctly sum up the motivations of politicians as a group. Obviously there are those with ideals or “purer” motives, but these are clearly the exception, not the rule. I am more interested in the assumptions regarding government. While I think it is clear that there is not a need for efficiency in the same sense that a private business has, it is not the case that government is per se inefficient. I concede that we will usually find that to be the case, I am just talking about the initial assumptions. I do not think efficient government would disappear, but it would likely reduce its power and influence. So I have seen your rules, now what are your solutions?